Postcard view Café Brauer (Lincoln Park Refectory), ca. 1940. The recent reopening of Theater on the Lake as a year-round restaurant and entertainment venue has made me think about Café Brauer, another Prairie style building in Lincoln Park. Both structures were the work of Dwight Heald Perkins (1867 – 1941), a Chicago architect who brought a progressive spirit and sense of humanism into his designs. Café Brauer, also known as the Lincoln Park Refectory, originally included a large upper level restaurant that also served as a dance hall and a smaller lower level café that provided a warming shelter for ice skaters. The full service restaurant, which operated from May through September, offered hot meals such as pot roast, chicken and okra, and Hungarian Goulash. 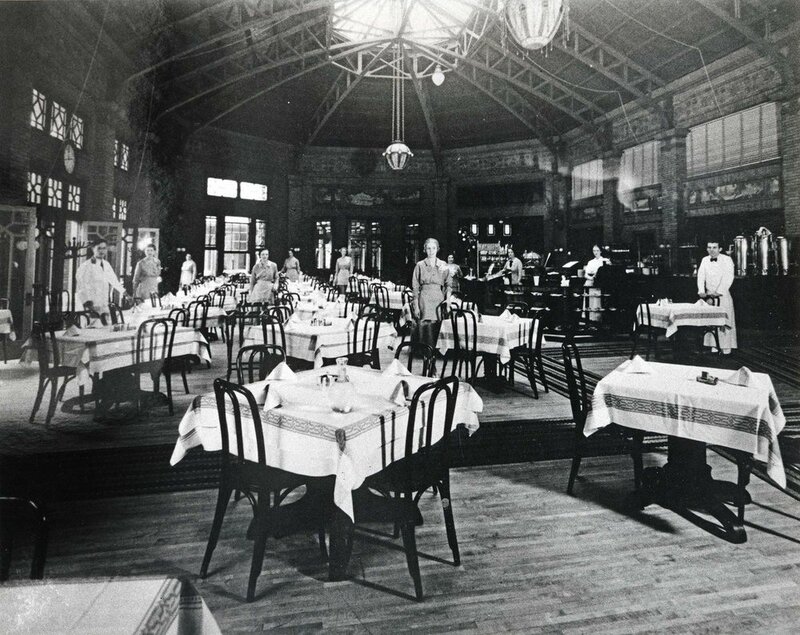 View of the Café Brauer restaurant in Great Hall with waiters and waitresses, ca. 1925. Theater on the Lake. Photo by Julia Bachrach. Dwight Perkins was appointed as chief architect for the Chicago Public Schools (CPS) in 1905, and he produced many innovative school buildings such as Carl Schurz High School. While serving as CPS head architect, Perkins continued to work for other clients, including the Lincoln Park Commission. At the time, he needed help to manage his heavy workload. John L. Hamilton (1878-1955), a CPS draftsman, resigned in 1905 to enter into partnership with him. Perkins & Hamilton designed Café Brauer in 1908. Three years later, they added a third partner, William K. Fellows. Perkins, Fellows, & Hamilton’s handsome Prairie style buildings include the Daily News Sanitarium, which later became Theater on the Lake. Postcard view of William Le Baron Jenney’s 1882 Lincoln Park Refectory. The Brauer Brothers were German immigrants who operated a State Street restaurant that had become quite popular in the 1890s. After the completion of the new Lincoln Park Refectory in 1910, the Brauers entered into a lease with the Lincoln Park Commissioners. They paid $7,500 annually to operate a large restaurant in the second story Great Hall and the smaller lower level café that catered to skaters in the winter. Café Brauer with boating concession along the edge of South Pond, ca. 1940. Chicago Park District Records: Photographs, Special Collections, Chicago Public Library. Café Brauer brick and terra cotta details. Photo by Julia Bachrach. According to the Lincoln Park proceedings, the commissioners had instructed Perkins & Hamilton to design a building that would “stand for all time and should therefore be built thoroughly well, and should be made attractive as the chief building of resort in the park for the public.” The architects clearly fulfilled this directive by producing a refectory that was much sturdier than the old frame one, but was also an extremely fine work of architecture. Crescent shaped in plan with two loggias that gently curve around the edges of the South Pond, the building nestles into the landscape. With a green ceramic tile roof and deep overhangs, the red brick building is enlivened by ornamental brickwork and subtle terra cotta details. Interior View of Café Brauer’s Great Hall. Photo by Brooke Collins. Within the interior of the Great Hall, Perkins & Hamilton incorporated a series of twelve ceramic murals that Richard D. Mohr, an expert on decorative arts, has described as “one of the most important tile installations in the United States.” The Clay-Worker attributes these exquisite faience tiles to Rookwood Pottery in Cincinnati, Ohio. 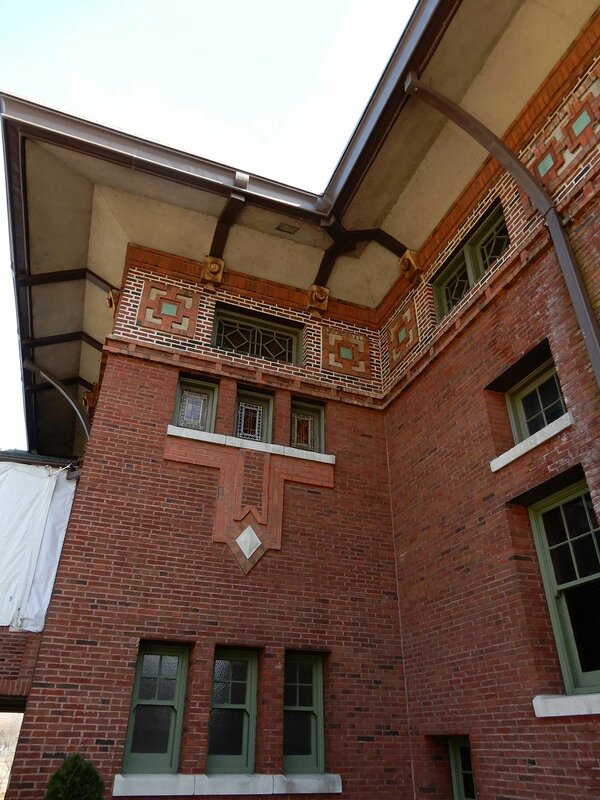 Rookwood produced many important Arts & Crafts style site-specific designs. The pottery was often executed with the squeeze-bag technique, in which a piping bag is used to lay down thin contour lines of liquid clay. These raised ridges help delineate the design and keep different glaze colors separate during both their application and kiln firing. The Café Brauer tiles are distinctive in that they feature both white and black contour lines in their designs. Rendering of a Jessie Arms mural in the Chicago Architectural Club Exhibition Catalog, 1907. Close up of Café Brauer Faience Tiles. Photo by Brooke Collins. Corner Details Café Brauer’s Great Hall Photo by Brooke Collins. Many Rookwood site-specific tile installations were designed by the company’s in-house staff. Occasionally, architects would submit designs by outside artists that would then be executed by Rookwood’s craftsmen. The creator of Café Brauer’s ceramic murals has long remained a mystery, but Richard D. Mohr recently published an article in the Journal of the American Art Pottery Association suggesting Jessie Arms (1883–1971) as the artist who likely designed Café Brauer's series of murals. A Chicago native and student at the School of the Art Institute, Jessie Arms was known for her bold, decorative depictions of natural motifs and for her mural designs, including Masque of Youth (1918) in Ida Noyes Hall at the University of Chicago. A catalogue the Chicago Architecture Club 1907 Exhibition includes illustrations of work by Jessie Arms that looks quite similar to the Café Brauer murals. Chicago Tribune Display Ad, June 23, 1940. Historically, Café Brauer was known not only for its lovely interior, but also for delicious food and excellent service. The restaurant received a rave review in Dining in Chicago, a 1931 book by John Drury with a forward by Carl Sandburg. Exterior view of Café Brauer. Photo by Julia Bachrach. Caspar Brauer died in 1940, more than a decade after the death of his younger brother Paul. The following year, the restaurant closed. The Chicago Park District used the refectory for dances and other special events for several decades, but the building fell into disrepair, and by the late 1960s the Great Hall was used only for storage. South Pond façade. Photo by Julia Bachrach. 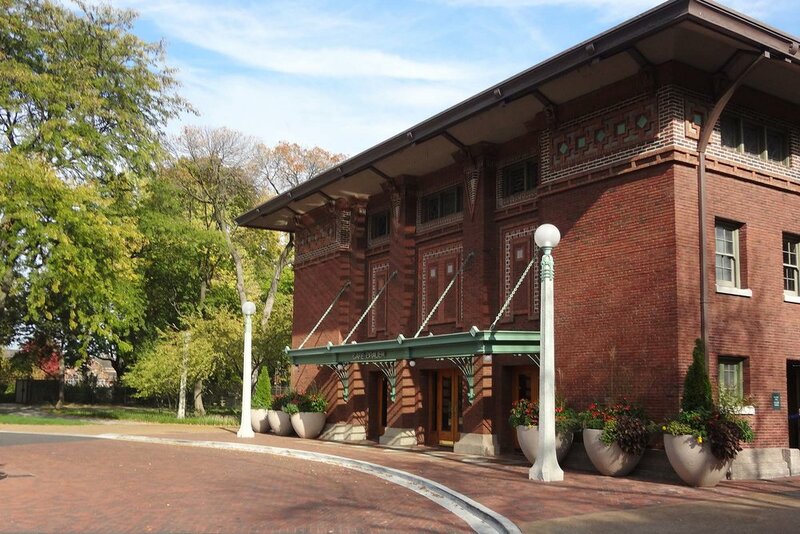 In 1987, the Chicago Park District and the Lincoln Park Zoological Society began an extensive restoration project to return the building to its original condition. Café Brauer reopened in 1990, and in 2003, it was designated a Chicago Landmark. Today, the Great Hall is available for weddings and other special events, and the lower level café serves as a Lincoln Park Zoo concession from late spring through early fall. This building has always been a personal favorite. If you ever get invited to a party there, you should go.